Capital One profit increased by 8% during Q2 2014 to $1.2 billion or $2.04 per diluted common share, compared to $1.1 billion and $1.85 respectively in Q2 2013. Credit card lending shows continued healthy growth, America’s eighth-largest bank holding company reported on Thursday. Revenue, however, declined for the third successive quarter to $5.47 billion compared to $5.64 billion in Q2 2013. Being one of the major American credit-card lenders, as well as offering auto loans, mortgages and bank accounts, Capital One’s results are commonly seen as a barometer of consumer sentiment. Card loans in the US, which make up more than half of the company’s lending, increased by 1% compared to one year ago to $71.2 billion. Most analysts had not expected to see any growth until the second half of 2014. Mr. Fairbank believes this was due to “increased traction” in reward programs and credit lines to customers. In Q2 2014, customer clicked up $52.7 billion’s worth of credit-card spending, eleven percent more than in Q2 2013. Capital One Financial Corp. was rated as a “Buy” by TheStreet Ratings team, which gave it a ratings score of “A”. Most CEOs do not last more than about eight years, while those of America’s largest 12 banks have a tenure averaging just 7 years. 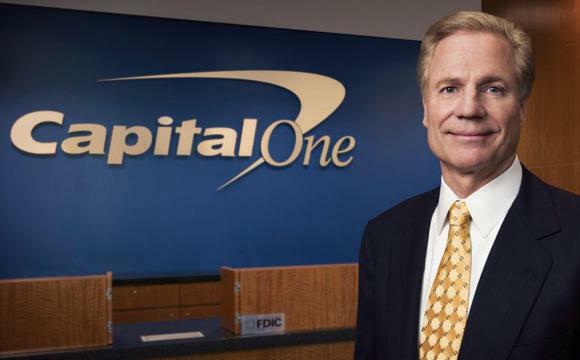 Richard Fairbank, however, has been at the helm of Capital One for two decades. Consumer Banking: 1) Auto loans were up 5% or $1.7 billion to $34.8 billion. 2) Mortgages declined by 4% or $1.4 billion to $32.6 billion. Interest-bearing deposit rate stayed the same at 0.6%. Capital One Financial Corporation is a financial services holding company that offers credit cards, banking and investment products, auto loans and mortgages. It has approximately 42,000 employees. Headquartered in McLean, Virginia, USA, it was established in 1995 after Signet Financial Corp spun off its credit card division. It is publicly traded on the NYSE (New York Stock Exchange) under the ticker symbol ‘COF’. Last year, Capital One was the fourth largest issuer of MasterCard and Visa credit cards in America.